Here’s more catch-up. I really wanted to do the #clairestelle8challenge on Instagram at least once and I figured right after vacation would be a good time. But I came home a little sick and was so tired that even though they cut the number of challenges in half i started behind by two. Ack. So this was the first of my catch-ups but I am posting it last. The theme was where you live. 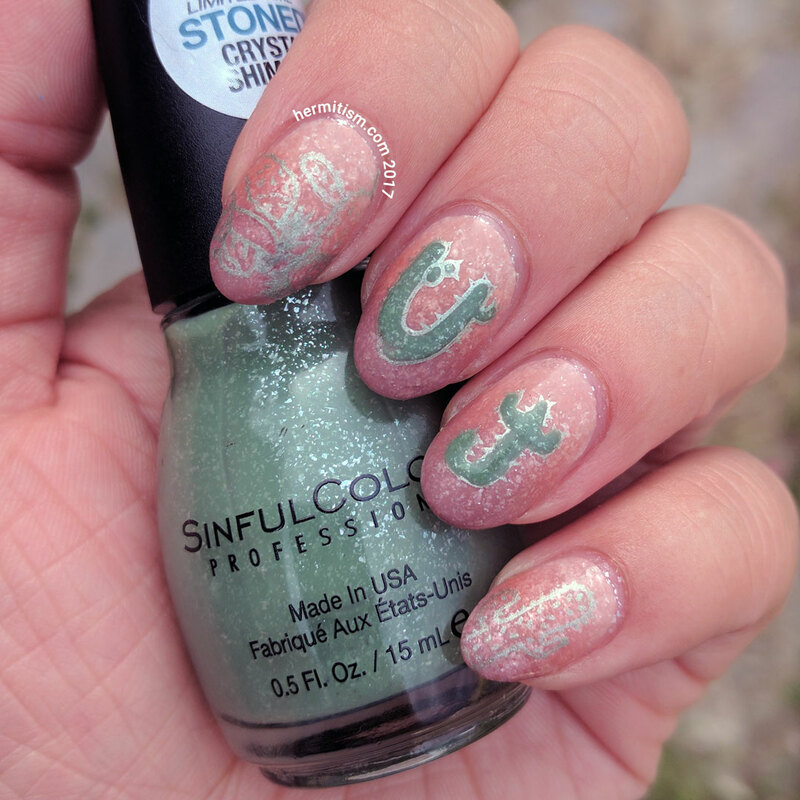 I was tempted to say wherever my cat lives and do a cat mani, but I decided that I had Sinful Colors’ Stoned Crystal Shimmer collection and that lends itself well to desert manis so…Utah. Land of people moving to the desert and then trying to pretend it’s not a desert by planting a bunch of grass. Seriously, I hope we as a country figure out climate-based landscaping in the next decade or so because we’re wasting more water on our stupid lawns than we use growing the crops we eat. Items listed in italics are being used for the first time. It was an extra bonus to finally get to use “Moss Have”. I think it was a holiday collection polish from two years ago. It’s a great metallic silver with an olive tint and it’s perfect for stamping. Ha ha, you’d be so proud of my lawn… I never water it so the grass is pretty scraggly and most of the yard is just dirt. Appropriately desert-y. The only thing saving the grass in my backyard is the fact that it is almost always in the shade so it doesn’t get the whole strength of the sun glaring down on it constantly. Love this mani- especially the use of the crystal shimmer polish as the base color! Such a perfect line for desert manis! 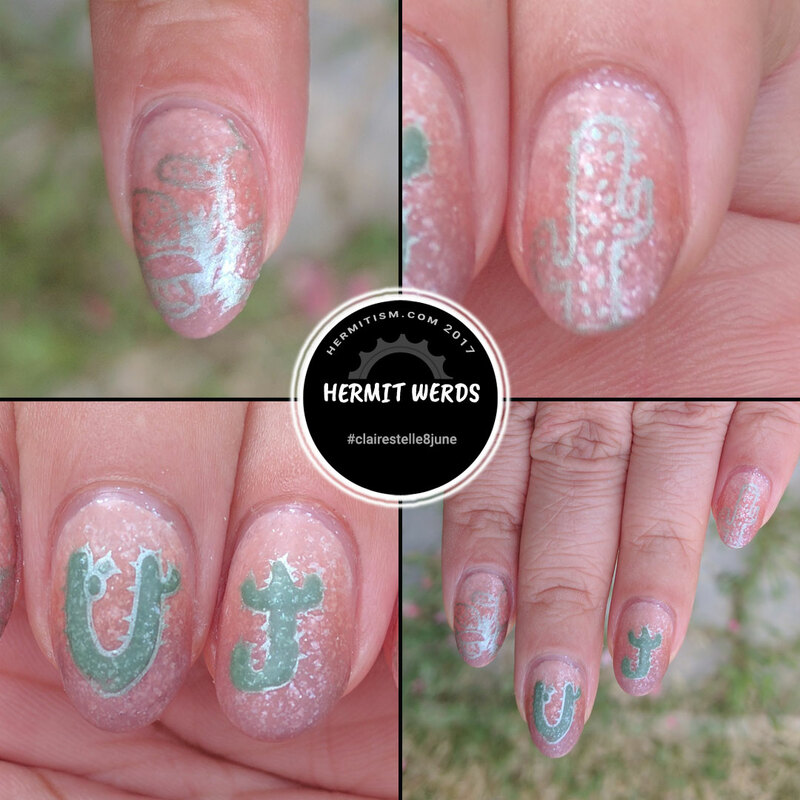 The sprinkler system was already not working when we bought our town home so all of the backgrounds in my nail art with the blurred brown and green? Yeah, that’s my collection of weeds and dirt in the backyard (we want to pave 90% of it over). I am proud of your lawn actually. ;D Even when I was living in Indiana where it is mostly green all year a lot of people let their lawns die in late summer because they didn’t have a sprinkler system installed to water with. So why are we so insistent on keeping ours alive? 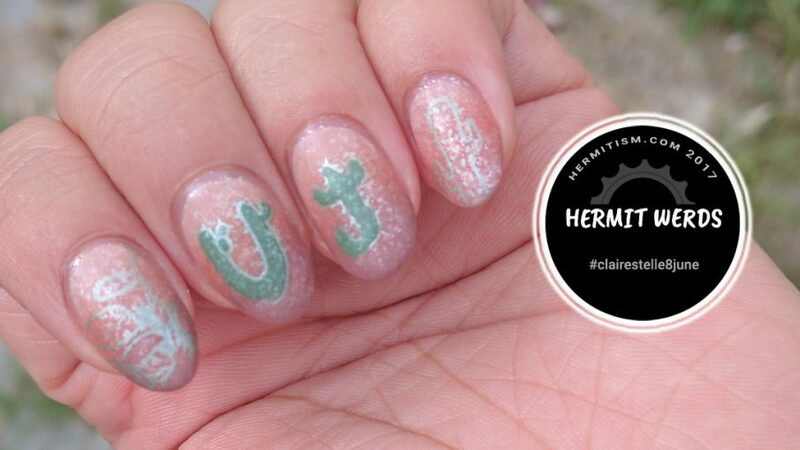 Ah, I am so glad your nail art sold me on the collection. I adore it. I think I need to do something with the gray one…Thera-pewter. It has not received enough love in this relationship.